P1. Heterodyne Systems is focused on the creation of the integrated phase-locked optical synthesis technologies that underpin coherent signal generation across the THz spectrum. These can be used to generate THz signals in the 0.1 THz to 2 THz range directly through photomixing in the uni-travelling carrier (UTC) photodiodes developed in P3, providing the room temperature source technology for ultra-broadband wireless development, for state manipulation and for spectroscopy work at up to 2 THz in P4. They also provide local oscillator sources for optically pumped mixers in P3, used in the coherent detection systems of P4, and locking signals for the tuneable QCL sources for the 2 THz to 5 THz range in P2. Finally, they provide heterodyne pumping for photoconductive sources in the 2 THz to 10 THz region developed in P3, for use in P2 and P4. Telecommunications wavelength III-V semiconductor technology will underpin the work The challenges are manifold, as we plan to create novel devices such as monolithic 10 THz span optical comb generators (OFCG), and multi-component Photonic Integrated Circuits (PICs) – including OFCG and Optical Phase Lock Loops. Finally, we will use the flexibility of the Programme grant to build on our demonstration of high quality quantum dot lasers integrated on silicon and germanium substrates to demonstrate THz PICs on silicon. The impact of this work will thus extend beyond the remit of the Programme itself. P2 Locked QCL Systems extends high power coherent technology to the region above 2 THz by developing phase-locked electronically tuneable quantum cascade laser (QCL) technology. The optical synthesis systems developed in P1 provide the reference sources for QCL locking, giving coherent capability over the full spectrum available from QCLs. The work includes novel coupling technologies, the use of InP-based materials systems to enable direct optical injection control of the QCL emission frequency, and the development of electronically tuned QCLs. We will design novel active regions to deliver broadband gain, drawing on our earlier work on electronic QCL frequency switching. We will demonstrate fast electronic tuning over a few GHz, and broad tuning over a >1 THz bandwidth, using GaAs/AlGaAs QCLs, and develop broadband InGaAs/InAlAs QCLs for direct injection locking at 1.55 μm. 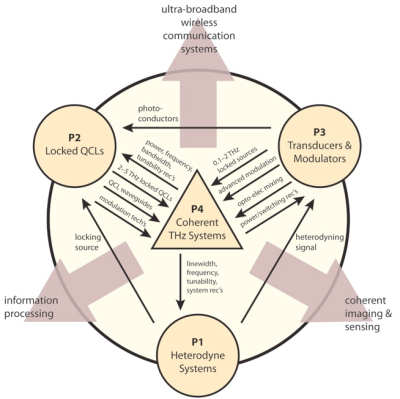 Phase locking techniques to enable QCL emission frequencies to be locked by the heterodyne systems of P1, including through the use of photoconductive device technology from P3, will form a key part of the project giving sources that can be used for state manipulation and imaging applications in P4. P3 Transducers and Modulators will develop UTC sources and UTC optically pumped mixers for the 0.1 THz to 2 THz range in discrete and phased array implementations. For frequencies above 2 THz we will develop InGaAs/InP photoconductive mixers using iron doping or novel ion implantation processes, both as sources in their own right, and for use in the QCL locking systems of P2. We will use our world leading work on high figure-of-merit THz travelling wave UTC- photo diode (PD) emitters with the integration technology of P1 to create phased arrays of UTC-PDs for high power, high directivity THz emission. We will also use our recent work on optically pumped THz mixing in UTC-PDs to create a coherent receiver PIC, thereby demonstrating the first fully integrated THz coherent system for frequencies up to 2 THz. Modulation technology will be directed towards integrating intensity and in-phase/quadrature modulators with the heterodyne systems of P1 to meet the requirements for ultra-broadband wireless and information processing in P4. Transducers and modulators will be integrated with the heterodyne systems of P1 and the QCLs from P2 to form a range of coherent sources and receivers to enable the applications of P4. P4 Coherent THz Systems is focused on the development of systems exploiting the THz spectrum for three major applications areas: ultra-broadband wireless communication systems; coherent imaging and sensing systems and systems for the study and manipulation of atomic states. With increasing wireless network traffic ranging from mobile wireless to home networks, spectrum congestion is becoming an acute problem. Pressure is increased by the widespread deployment of Fibre-To-The-Home bringing very high transmission capacity closer to the end-user. Use of higher, currently licence-free, frequencies (e.g. 350 GHz) for short distance communication offers potential data rates of > 50 Gbit/s, a thousand times greater than Wi-Fi, coupled with reduced interference. Technology from P1 and P3 will be used to create compact, low power consumption THz band wireless links having unprecedented throughput – the inherently coherent scheme based on an heterodyne local oscillator allows the use of complex modulation, thus allowing data rates of >100 Gbit/s to be realised within electronics-constrained bandwidths. We will develop coherent, compact, CW, high spectral power density and high-resolution imaging systems. These will be based on the high-power (>100 mW) tuneable THz frequency QCLs from P2 and the synthesis technology of P1. Development of coherent THz spectroscopy will have impact far beyond its use in applications for sensing and analysis of materials. Coherent THz radiation using sources from P1-P3 will allow measurement and manipulation of quantum states, a key technology for information processing beyond the limits set by geometric scaling (i.e. beyond Moore’s Law), including (Quantum) Information Processing. Device and sub-systems technology development is based on a cyclic process, with system design requirements and experimental results from P4 driving iterations of technology development in P1 to P3 throughout the programme. Bringing together this comprehensive technology base from materials through physics to engineering, with demanding applications challenges ensures matching of technical solutions to applications need. The Programme Grant mechanism offers a highly efficient use of resources, as an optimum selection can be made for each application from the technology platform created.